I am delighted to be here, especially since the last time we met, in February last year, we were facing an election in 2017. Now the election is behind us, we can get back to business, and certainly work to meet the challenges that we all face, together. We have been through a few challenges over the past few years. The pressures brought about by the low commodity prices, compounded with a long drought that brought hardship to many of our businesses and communities’ right throughout the country. And the challenges that we face as an economy, that has confronted many similar economies around the world, who have gone into recession, except for Papua New Guinea, where we have been able to ride out these challenges. Last week, I attended the 48th Meeting of the World Economic Forum, in Davos, Switzerland. One thing that was very clear to me at this meeting, was that World Leaders and World Business Executives, have a renewed sense of commitment, in the improved global economic position over the coming years. But, there are certainly risks, and there is still instability in some areas, but, the general outlook quite positive. For Papua New Guinea, some of our development partners, such as IMF and World Bank, have made very strong positive projections of our own destiny and our economy. These institutions have been very frank in their assessments of the economy and growth, and it’s heartening to see their perspective on how we are tracking. As I said, since last February, our people have voted, we have formed a new government. During the elections, there were isolated problems. The election itself has been concluded in a peaceful manner. Our country has seen stability in politics over the last fifteen years more than any other time in our history. In the space of fifteen years, we have had only one change of government. Now that our government is in its seventh year, we continue progressing the initial commitments and policies that we have made to our nation, and our people have endorsed. This includes the free education program, better healthcare delivery, particularly to the rural communities and remote districts right throughout the country. And of course, delivering government services right to the districts and rural communities. We are building a strong infrastructure, improving law and order and giving more economic opportunities to our people. We know that these policies are good and they are working, but there is also room for improvement. Moving forward in this term of parliament, we are wanting to build on the economic turnaround and stimulate more business growth. We are committed to delivering on our policy agenda as we have done in the past, and again our people will judge us in 2022. But, we have made a very strong commitment that we are going to bring more reforms in our system of government. Particularly, in the terms of the electoral reforms that we intend to carry out. We have seen the benefits of the preferential voting but we have also seen some of the setbacks around this process as well. We have had to endure an election process for over three months, costing well over K500 million. Voting and counting has also being complicated by disputes in the counting process. We need to reform this so that we can make it easier, and less costly. The second area of reform that we are committed to, is public sector reform. As we speak today, every year, without fail, it is costing our country over K300 million in overrun costs in our public service machinery. This could be spent better in other sectors of our economy, and it is important that we continue to make reforms, whereby we want to make savings, particularly where there are a large number of unidentified people on the payroll, consuming substantial amount of government resources. To the business community, there have been calls for taxation reforms. We have seen that has never really been a truly successful tax reform carried out in the past. In our term, we have tried to set up a team to look at taxation regimes so that they can give us advice on how we can progress some of the reforms we are all wanting in this sector. Unfortunately, they were not completed in a manner that we were happy with. The ad hoc manner that we manage our taxation system in the country is something that this government is focused on reforming. Revenue collection is much lower, and there are a number of businesses that are not paying their fair share of taxes. We are not asking people and businesses to pay more tax, we are asking everyone to pay their fair share, and that is something that we are willing to work towards as a government. It is fair to say that some of the tax rates that are being imposed on businesses and individuals, especially families, are too high. Our government is now in the process of reassessing that, with the desire of reducing those rates in a sustainable but gradual manner over the next few years. That will begin in the next financial calendar year. We must make sure that our taxation system is well suited for Small to Medium Enterprises in the country, as compliance has been sometimes complicated and costly for small businesses. Our aim is to try to make it easier for this regime to be administered. We are fully committed to this so that we can give our families and businesses a better chance and encourage them to invest more in their families and businesses. Government is committed in making sure that we broaden our economic base. We don’t want to be overly dependent on the minerals sector, and oil and gas sector, we want to make sure that we address the issues around agriculture, fisheries, tourism and other areas that has got great potential in this country. We must get the balance right between developing our oil and gas reserves and developing other sectors of the economy. We cannot keeping letting our economy be held at ransom by the boom and bust cycles that we have been experiencing over many years. The time for talk is over, now is the time for us to implement the policies that will stimulate growth in these areas. I think the strong message that our budget for 2018 has given to the business community is that we are serious in this sector. It is not good enough for our cash crops and agriculture exports to continue to be on the decline except for Palm Oil Business. The industry has been growing very strongly for our country. The performances in coffee, cocoa and copra sectors have not advanced. In fact, they have on the decline. The problems are very clear, over the years, we have seen the decline of extension services and a failure to address our need for management support to rural communities and especially small farmers. A lack of capital and credit in these areas has lead to the decline of these sectors. We must continue to support our rural majority by again supporting the extension services in agriculture, providing best management practises to the rural communities and building more decent infrastructure for them, especially roads, bridges, airports and ports. We hope to find a right balance in the coming years, so that we can continue to strengthen food security in our country. Our population is increasing at alarming rates. We cannot continue to import food to sustain our people. That is an unsustainable path. An example is that, Papua New Guinea’s position now, in fisheries, particularly in tuna, has been addressed whereby we want fish to be processed in our country. Companies that play by the rules will continue to grow their business and employ more people. Our government is a very strong private sector supportive government. But we want to grow these sectors of agriculture and fisheries, so that we can also feed our basic needs. Another hotly debated issues in the newspapers recently is the production of rice. Papua New Guineans are consuming more rice on a daily basis than ever before, this is an essential product that we import into the country and is becoming a staple diet for many families. We have no choice but to grow our own rice. We cannot let the food security of our people be undermined. I will not allow one private sector monopoly to be replaced by another. The market has to be competitive. Some of our critics have made comments about the quota system. I don’t know how many times I have to say this, if you don’t grow rice, you will not get a quota. Simple as that. I think it is important that we debate these issues in perspective, so that we know the real challenge that we have. We have been misled for many years that we cannot grow rice in our own country. Now we have engaged many experts, who advise us that it is possible. We have no choice when agriculture is one area now we are investing in as government directly, by taking up equity with development partners in addressing food production in our country. We will continue to do so until the private sector can be able to invest in these sectors alone, without the support of government. We are expanding support in infrastructure building right throughout the country. Through our investments into the districts, we are maintaining roads, maintaining infrastructure, and making sure that small businesses continue to operate. The DSIP that the government continues to roll out into the districts is largely beneficial to small to medium enterprise workers and businesses in those communities. It is benefiting them directly every year because they employ people to do the work, and they carry out small contacts for the districts in maintaining assets and infrastructure right throughout the country. Another area we having been focusing on is tourism. Again, it is not the first time we talk about our unique attractions, rich culture, diverse landscapes, and the things that we can offer a tourist to experience. But, without the right infrastructure, nothing will happen. Our government is now working with potential investors in building tourism hubs right throughout the country and one of the first areas that we are looking at is Kokopo. Significant investment is essential to kick start tourism in this country. We are looking for some real progress in this area, and I know that areas such as the Kokoda Track, continue to attract a lot of foreign visitors every year. The cruise ship sector is again a demonstration of our potential, and we can achieve more from this service. I think it is also important, that some of our own financial institutions, should see examples like in Fiji, where the major investors in the tourism sector in Fiji are super funds. I think the times of just investing in real estate in Port Moresby should be over. Let us diversify in Portfolios so that we can be able to work with you. If there is a risk in investing in tourism in the outer centres of our country, as I have said, like in Agriculture, Government is interested in participating with equity to support you at the initial stages. It is not Government’s attempt to try and get into these businesses, but I think we need to have a real kick start as we have done in other sectors. Today, I give you another example of our Home Ownership Scheme that we have with BSP. I hope other banks can take this up as well. With the initial K200 million we invested, we are expanding to K400 million. Through this program, thousands of small Papua New Guinean families are able to have a home for the first time. These are the sort of initiatives that we are ready to support with private sector in making sure that our people continue to benefit right throughout the country. The other area that we wish to advance are Small to Medium Enterprises. This is very crucial to making sure that we provide job opportunities for our people. Our small businesses are dynamic, and they are hungry for growth. We must do more, we must support more. This is about making sure that they have the right policies and again, making credit available to small to medium enterprises. We must make sure that the financial houses are proactive in partnering government and making opportunities available. Government’s investment alone in the National Development Bank is not enough, we need to do more. And there are opportunities where it will give the financial establishment the right returns that you require. But this is not a one-way street, it is not a social obligation, but we are providing business opportunities. Supporting small to medium enterprises right throughout the country will help you to make a return. This a priority of this government in this term of parliament. We understand the issues regarding infrastructure. Infrastructure right throughout the country before we came to government, had been largely neglected with piecemeal maintenance approaches right throughout the country. We have changed that around. Unlike previous governments, we see the importance of infrastructure, and the importance of building cities and the importance of building roads around districts. We have a very comprehensive infrastructure program that is happening. I want to thank institutions like the Asian Development Bank and the Exim Banks right throughout the world, including Chinese and Japanese. They are strong partners in investing in infrastructure at very concessional rates. The rates that they give are less than two percent, some are even more generous than that, with more than thirty or forty year loan repayment periods, building the key infrastructures that we need. Over the last five years, we are seeing real improvement in the delivery of ports in our country, such as the two busiest ports, Lae and Port Moresby. At our airports we are building, including expansion in Hagen, in Hoskins, in Vanimo, and in Goroka. We are now working with JICA on the Lae Airport. Making sure that there will be real difference in the way business is conducted in Lae city. We are investing more in the Highlands highway through the recent 300 million Dollars being provided by the ADB. We are just now going to technical design, and almost ready for advertisement. I think expressions have been going out. Shortly, the Central Supplies and Tenders Board and our technical people will make the assessments and we will roll out these programs. We want a world class asset that is going to serve our people for a long time. We are again working closely with the ADB and expanding the program to the balance of the Highlands Highway, so that we can have this particular infrastructure, that is going to be the economic lifeline for our country, maintained to an international standard. Every year, government invest in maintenance money that is not really solving the key problems of the highway itself. We must rebuild it to a world class standard. And we are, of course, working with our partners, the Australian Government, in other infrastructure like telecommunication, such as the undersea cable linking Sydney and Port Moresby. Our own internal PNG led government program is laying sea cables right throughout PNG coastal cities so that we can link the entire country, giving real opportunity for much lower-cost telecommunication infrastructure to our citizens so that they can expand their businesses and be competitive with Digicel. I know Digicel has done a great job in this country, opening up opportunities for our citizens. But we must make this market very competitive. Complacency is not good enough anymore. We wait and see, so that we can solve the problems tomorrow before the problems get even worse. That is why, we have to attend to it today. Infrastructure like telecommunication and electricity is crucial for business and development of any nation. I am pleased to see that there is new enthusiasm at PNG Power, which has been mismanaged for many years. Many of the executives at State owned Enterprises are fairly well paid. They are the highest paid people in the country, and yet, the services that our people and our businesses are getting is below standard, below expectations. They need to perform. We must deliver reliable power to our people. I was very disappointed to hear Lae was without power for over eight hours. That is simply not good enough. This is the sort of mentality that needs to be reformed. Those who are not able to perform will be told to get out. We don’t owe you a job, the country does not owe you. We owe it to the country. We owe it to the business community, we owe it to the people. We have certain guidelines that we have set for our nation. By 2030, we have said seventy percent of our population must have access to reliable electricity. We are serious about this commitment. But, if you are not going to do your job, our people will not have access. Their lives will not improve, their standard of living will not get better. That is why, our people in Public service, particularly SOE’s, need to step up. Finally, just to give you a bit of briefing on APEC. We have been a member for well over 20 years. We are very fortunate to be a member of this particular, exclusive organisation of twenty-one economies controlling well over fifty percent of GDP. Well over fifty percent of global trade is being controlled by these twenty-one nations. Papua New Guinea is the only developing Pacific Island Nation to be in APEC. We have never hosted a Summit and of course several years ago, when our economy was doing well, some of our senior people advised that we should look at the possibility of hosting the meeting and I agreed. Then of course the critics out there say that this is going to be too expensive for the country. Let me say this, for too long we have been known for all the wrong reasons globally. Some of this has been of our own making, but mostly its perception. This is an opportunity for us to tell the world who we are. There will be over ten thousand business and government leaders, many representing Fortune 500 companies, the biggest global investment fund managers, the biggest banks who are going to be in our country for at least over a week. What better opportunity is there for us to showcase our country as an investment destination. Where they can come and invest, where they can come and work. APEC has of course, cost money to host, but we are spending that money on infrastructure that is critically needed for this country. Where we have side meetings outside of Port Moresby, we are building infrastructure. We are building airports, we are building hospitals, we are building schools, and we are building infrsatructure that is going to serve our people well into the future. It is not a one off expenditure or one off infrastructure. In Port Moresby we are building roads, we are building buildings and airports, are going to serve our city for many years to come. Buildings that we are going to use for meetings are going to be converted into world class museums. Many of you know for a fact that Papua New Guinea has got the most unique cultures and artefacts that we can display to the world. I think it is sometimes easy to say that we are spending a lot of money, but the infrastructure investments that we are making will benefit the nation for many years. And of course, within the APEC year, with government and business leaders that are going to be here, they will spend over K200 million in our economy on airfares and accommodation, and the administrative requirements of their delegations. Our Government is not paying for delegate accommodation, they are paying their own way. That means they will spend money in our country so it is a great opportunity for some of the hotels and guest houses. All the guest house owners must also not be too generous. When we go to visit their countries, they charge us high rates so during the Leaders’ week. I think it is a good opportunity for us to have positive injection into our economy. Finally, I know that foreign currency is a big issue for our businesses and I know the stresses that many of our businesses are facing. Also, we understand the backlog of issues, and backlog of payments that need to need to be made for imports, this has forced us to rethink how we do business in our country. Firstly, let me be very thankful to some of our investors, who are investing in sectors for import replacement. That is certainly going to make sure that money stays in PNG and is not exported to create jobs outside the country. And that is now starting to take shape, many of our business leaders are starting to think outside the box. This is something the government supports and will continue to support. In terms of immediate availability of foreign currency, as I said in some of the meetings that I have had with some business leaders, is that government is working with our bilateral partners. Both the World Bank and ADB have already shown support for up to US300 million each, to fund to PNG for budget support which will mean that the funds will be used to make more currency available for the banks to utilise. And we are also expanding our interest in the issuing of the Government Bond. Our discussions with many financial experts around the world, a few years ago, when we were supposed to issue Government Bond, did not eventuate. We didn’t think that the market was in the right place at the time. 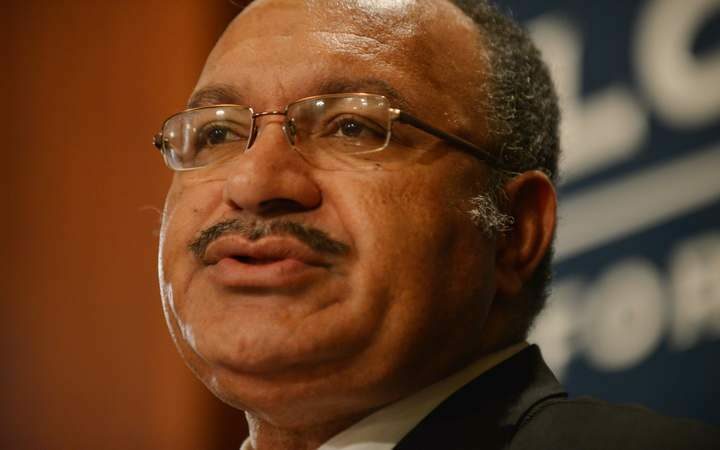 The costing of issuing that bond was too high a price for PNG to pay. But, we are told that over the next few months, the timing is right for discussion with many financial institutions around the world. Our experts at treasury are handling that discussions with Bank of Papua New Guinea. I am certain that many of our financial leaders who are in this room will be party to those discussions. So in the short term, I see that conditions will ease, but the main thing has been that we need to start looking back at some project agreements that we signed with some of our exporters. It is time for a review. We cannot allow all our revenue, that is coming for exports is parked in foreign bank accounts, while our country is in need of this currency. We understand, many of the projects financiers want some of these funds to be outside for the repayment of loan facilities that are available for projects. But, for administrative expenditures, I think businesses and many of our investors need to be fair to our country as well. Don’t put unnecessary demands upon us. We need to be fair. We know that you need to make a return on your investments, and there is no issue with that, but the country needs the right revenues as well for its people. We look forward to working with you, our business community, over the next few years. It’s going to be challenging but I think we are turning the corner. We have to be positive about our country and ourselves. If we are not positive then nobody else will be. We have to believe that the country has a bright future and opportunity. We can only achieve that by working together. I am very confident about our future because we have the right policy mix that is going to drive economic growth, and drive the development for our people, particularly the delivery of services to those who need it most. I wish you well today for your discussions. Thank you very much for giving me time to say a few words.